Jordan's been working up in Brigham City for this past little while and with that has come nights that he stays up there on the job. They save a lot of (travel) time staying up there which helps them to get more done. I haven't minded it too much because it is usually only for one night at a time. In fact, I find that I've been able to catch up on a little bit of my memory keeping because I can do it after I put the kids to bed. So between the hours of 9:00pm to Midnight I've been crafting while Jordan's away. I'm so glad that me and paper are friends. Its always harder to photograph pages at night, so the colors may not apprear true, but at least you get the idea. 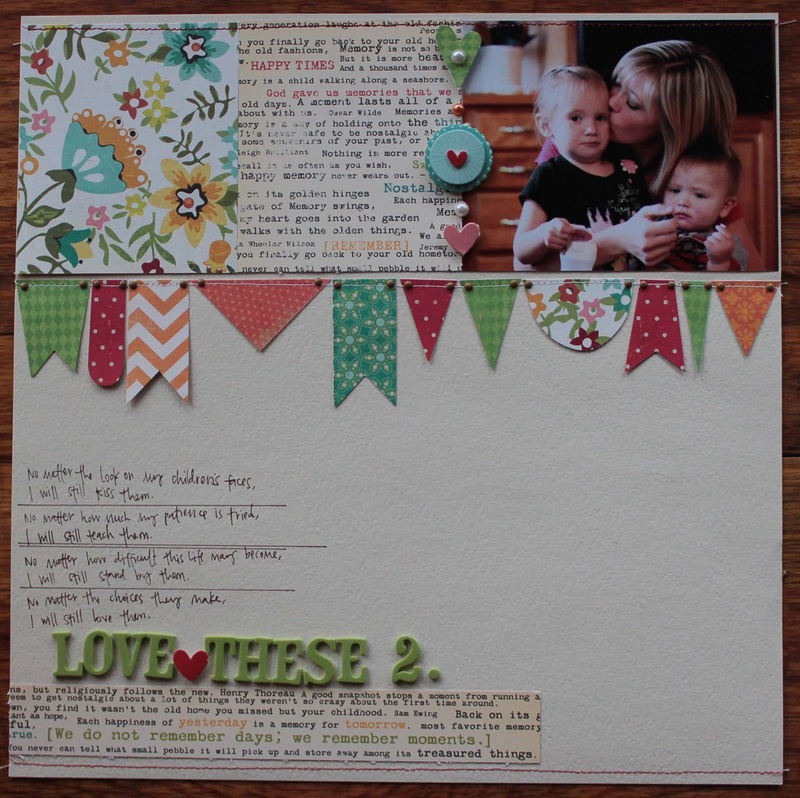 The "LoveThese2" page was a copycat from a similar page I saw online somewhere. I loved the horizontal banner idea so I recreated it here with my own theme and a few changes. I think I completed seven scrapbook pages in one little 3 hour block of time. I haven't photographed all of them yet but here are three of the seven. The one of Wesley (above) and Liliane (below) highlight photos I took at the pumpkin patch in the fall. The children loved that activity! As I looked over the pages I had created that night, I saw a very common theme among all of them and that is my journaling. Telling the story of the photo is a key element in my scrapbooking and I like it that way. Maybe I talk to much. Or maybe I just like to tell stories. Your designs are great. Especially love the top layout. Taraleigh! Love the pages! Isn't it amazing what you can do at night! I realized that when Bret was working graves! Can't wait to see more!